"Two years ago, I saved my only son by donating a portion of my liver to him. He was admitted to the hospital when he turned one. I promised him that day that we will never celebrate his birthday in the hospital again. But I failed. He just turned 4 years old now and is battling for life in the hospital again. He means the world to me. My little one wouldn't sleep without wishing me goodnight and used to wake up early to kiss me a good day. My son never failed to surprise me by staying awake the days I came home late at midnight. 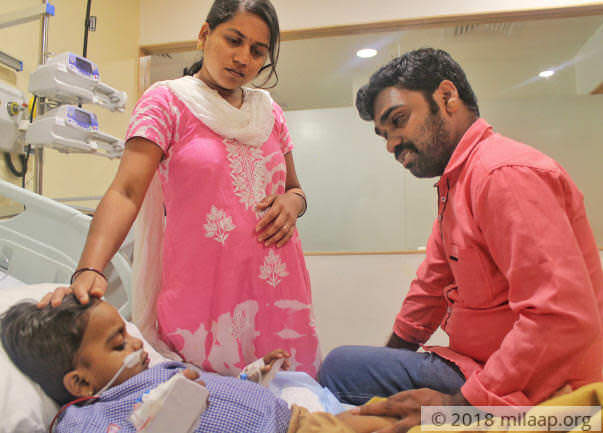 Past 10 days in the ICU were the most terrible, the sight of him fighting in the ICU was unbearable," - Manjunath, Thanmay's father. When Thanmay was 10-month-old, Manjunath found something hard in his stomach while giving him a bath. 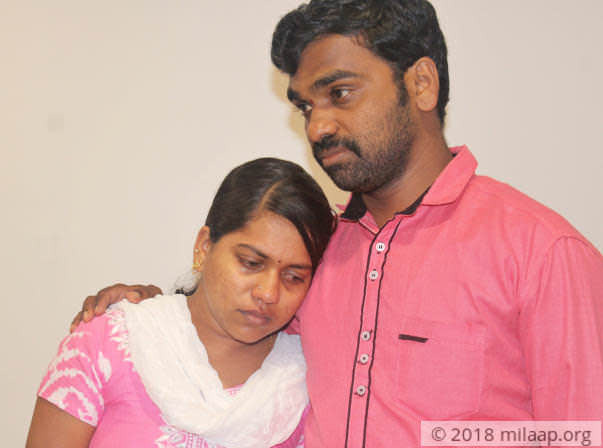 Worried Manjunath alerted his wife and they rushed him to the hospital. They were almost sure that no harm would come to him but sadly, the twisted fate planned the worst for them. He was diagnosed with liver cancer. "We were shocked, I couldn't believe what the doctor was saying. I took my son to another hospital but when they told the same, I felt the unbearable pang of pain and almost fainted. I wept inconsolably. My tears wouldn't stop until my wife said that we have to hurry to get help. But unfortunately, my friends and relatives asked us to give up on our child. But how could we? With God's grace he was saved with generosity of many kind hearts. But now he is facing the same fate and I feel completely lost. With my earnings as a driver, I cannot even afford hospital admission for him." - Manjunath. Thanmay did well for two years after the transplant. His parents got admission for him in a play school 5 months ago. 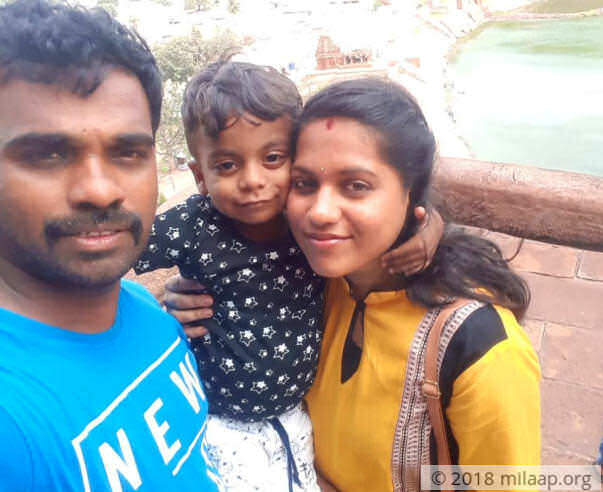 Just when this couple thought their son is beginning to live a normal life he was attacked by jaundice. They thought it will be cured in a few days. But sadly, his body rejected the new liver. 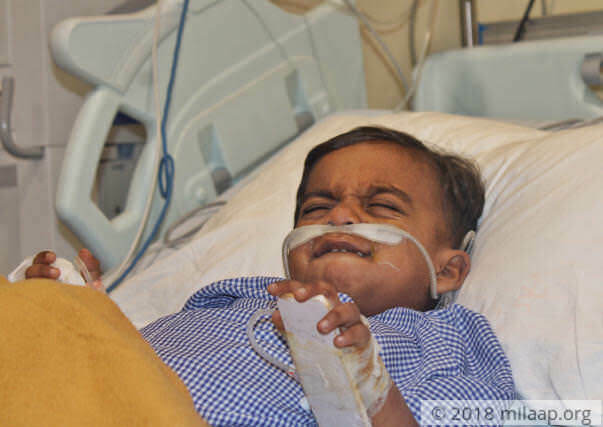 This 4-year-old little boy was admitted in the ICU for 10 days and doctors said that he needs proper and intense medication to survive. 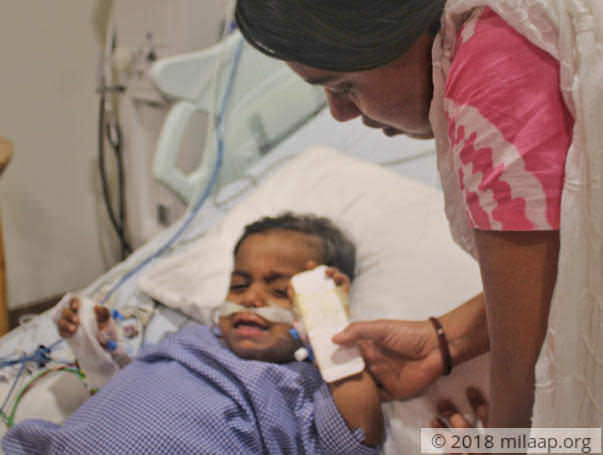 Only this urgent treatment stands as a last resort to save Manjunath and Deepika's only son. "My son cries day and night with severe stomach pain. It has become an everyday challenge for me and my wife to console him. He wants me to stay next to him every day. But if I don't drive my cab, I won't even able to feed him the next day. My wife tries to distract him from the pain but nothing works. He just learned to say a couple of words. Whenever I call her to check on my son, all I hear is her cry and my son calling out for me 'appa, appa.' I struggle to fight back my tears and continue to drive. He is very close to death and we don't have time." - Manjunath. Manjunath is the sole breadwinner of the family. He earns a very meager amount. With his little income, he not only tries to feed his family but also tries to save some amount to provide proper education for his son. 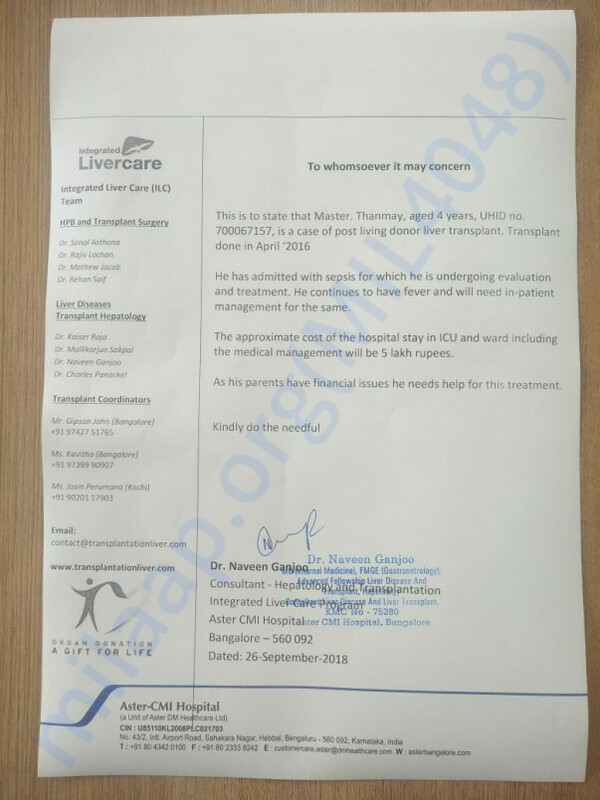 He received help from many people for the transplant. Now, he is struggling to even afford for the ICU admission. 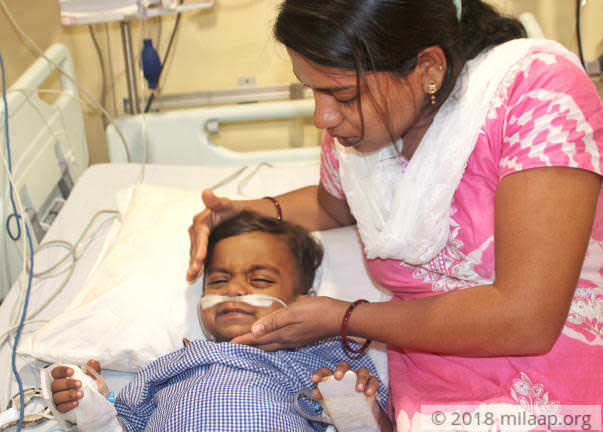 The family needs 5 lakhs and they cannot afford the treatment that can save their only son. 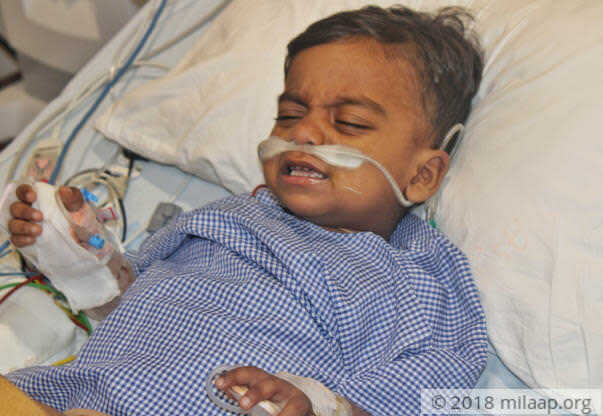 4-year-old Thanmay's body had rejected the transplant and he urgently needs intense medication. The parents who dearly love him cannot bear the expenses of the treatment. They have exhausted all the money and crowdfunding stands as the only hope. Without this urgent treatment, this couple will lose their only son. I'm grateful for the love and support showered on my Son. Thanmay is doing good now. We are taking him to the hospital every month for the blood tests to observe the condition of his health. He has also started going to school as well. Please pray for his health and do share the campaign. Thank you for the love and kindness shown towards baby Thanmay. He is at home and doing well. His blood reports are showing improvement and his energy and appetite has improved. He is continuing to show improvement and we are hopeful that he will be a happy child once again. Not so long ago we came together to support Baby Tanmay, who needed a liver transplant and successfully underwent the transplant too. We are grateful to each and every one of you for the timely support. 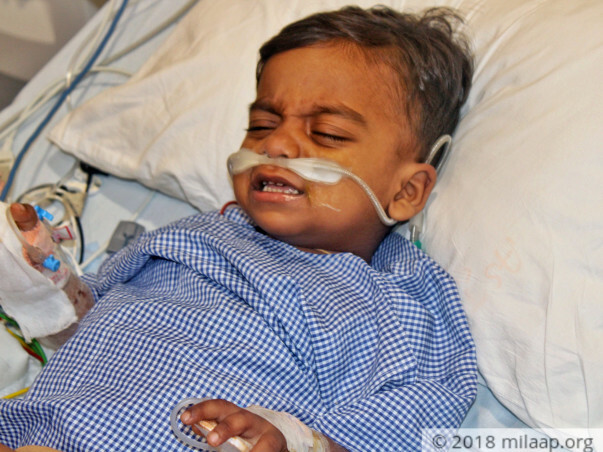 However , unfortunately Tanmay has been admitted in the hospital for a severe case of sepsis and continuous fever. He is currently in the ICU and needs further medical management. The patient requires another 5 Lakhs for the treatment. Please do share it with your network and save this baby boy again. Pray to god for your receovery! !